Big data analytics involves examining large amounts of data. This is done so as to uncover the hidden patterns, correlations and also to give insights so as to make proper business decisions. Basically, organizations have realized the need for evolving from a knowing organization to a learning organization. Essentially, businesses want to be more objective and data-driven, and so they are embracing the power of data and technology. The big data concept has been around for many years. Decades before the first mention of big data, businesses applied analytics on the data they collected so as to gain insights and uncover trends. 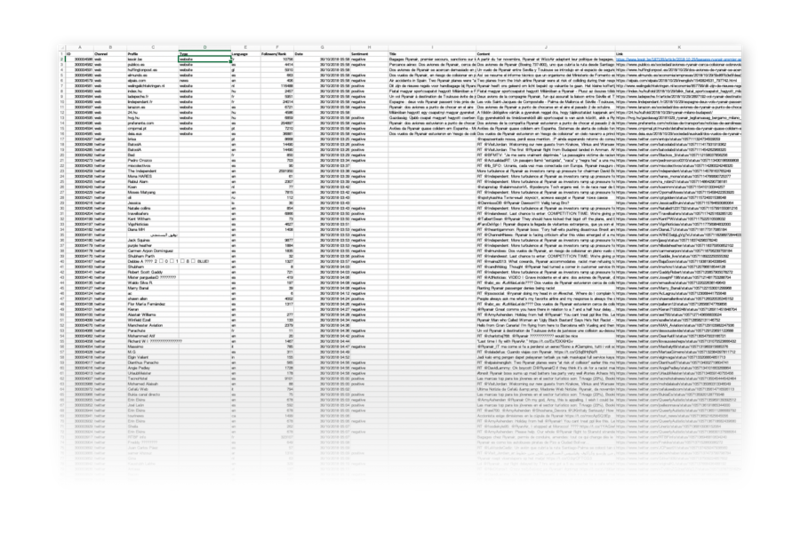 This involved capturing numbers on a spread sheet and manually examining the numbers. Big data analytics is done using advanced software systems. This allows businesses to reduce the analytics time for speedy decision making. Basically, the modern big data analytics systems allow for speedy and efficient analytical procedures. This ability to work faster and achieve agility offers a competitive advantage to businesses. In the meantime, businesses enjoy lower cost using big data analytics software. Organizations have invested in big data analytics. Think of a business you know that depends on quick and agile decision to remain competitive. In this article, we give five real-world examples of how big brands are using big data analytics. Keep reading to gain more insights. The customer is the most important asset any business depends on. There is no single business that can claim success without first having to establish a solid customer base. However, even with a customer base, a business cannot afford to disregard the high competition it faces. If a business is slow to learn what customers are looking for, then it is very easy to begin offering poor quality products. In the end, loss of clientele will result, and this creates an adverse overall effect on business success. The use of big data allows businesses to observe various customer related patterns and trends. Observing customer behaviour is important to trigger loyalty. Theoretically, the more data that a business collects the more patterns and trends the business can be able to identify. In the modern business world and the current technology age, a business can easily collect all the customer data it needs. This means that it is very easy to understand the modern day client. Basically, all that is necessary is having a big data analytics strategy to maximize the data at your disposal. With a proper customer data analytics mechanism in place, a business will have the capability to derive critical behavioural insights that it needs to act on so as to retain the customer base. Understanding the customer insights will allow your business to be able to deliver what the customers want from you. This is the most basic step to attain high customer retention. A real example of a company that uses big data analytics to drive customer retention is Coca-Cola. In the year 2015, Coca-Cola managed to strengthen its data strategy by building a digital-led loyalty program. Coca-Cola director of data strategy was interviewed by ADMA managing editor. The interview made it clear that big data analytics is strongly behind customer retention at Coca-Cola. Below is an abstract of the full interview on what Coca-Cola had to say about the role of big data in achieving customer retention. How much does the role of data play in Coca-Cola remaining relevant and staying connected to its consumers in the age of digital transformation? What about data and product development? Data plays an increasingly important role in marketing and product development. Consumers do a great job of sharing their opinions with us – either by phone, email or social networks – that allow us to hear their voice and adjust our approach. We often talk about why we have two ears and one mouth – it’s better to listen more than we speak. This holds true with our approach on consumer input. Data is also helping us create more relevant content for different audiences. We want to focus on creating advertising content that speaks differently to different audiences. Some people love music. Other people watch every sport no matter what time of year. Our brands are already visible in those spaces, and we’re working hard to use data to bring branded content that aligns with people’s passions. Big data analytics can help change all business operations. This includes the ability to match customer expectation, changing company’s product line and of course ensuring that the marketing campaigns are powerful. Let’s face the naked truth here. Businesses have lost millions spent in running advertisements that are not fruitful. Why is this happening? There is a high possibility that they skipped the research phase. After years of cautious enthusiasm, marketing and advertising technology sector is now able to embrace big data in a big way (Medal, 2017). The marketing and advertising sector is able to make a more sophisticated analysis. This involves observing the online activity, monitoring the point of sale transactions, and ensuring on the fly detection of dynamic changes in customer trends. Gaining insights on customer behaviour takes collecting and analyzing the customer’s data. This is done through the similar approach used by marketers and advertisers as illustrated. This result into the capability to achieve focused and targeted campaigns. A more targeted and personalized campaign means that businesses can save money and ensure efficiency. This is because they target high potential clients with the right products. Big data analytics is good for advertisers since the companies can use this data to understand customers purchasing behaviour. We can’t ignore the huge ad fraud problem. Through predictive analytics, it is possible for the organizations to define their target clients. Therefore, businesses can have an appropriate and effective reach avoiding the huge losses incurred as a result of Ad fraud. 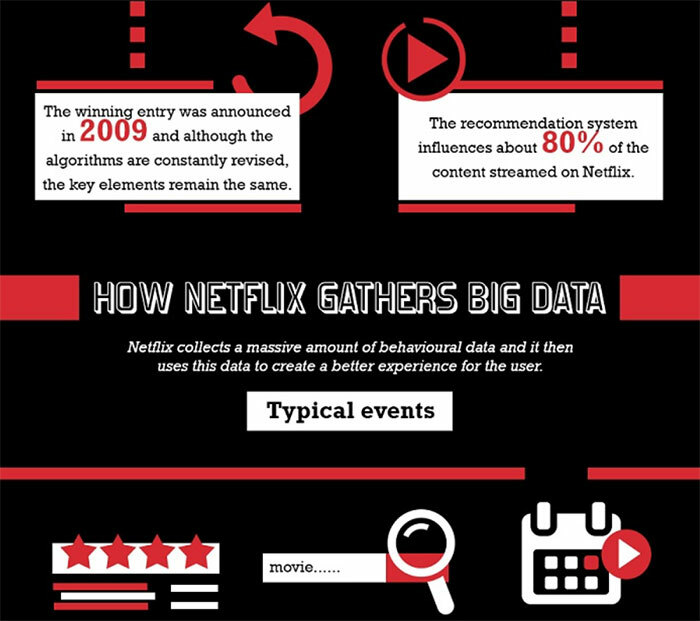 Netflix is a good example of a big brand that uses big data analytics for targeted advertising. With over 100 million subscribers, the company collects huge data, which is the key to achieving the industry status Netflix boosts. If you are a subscriber, you are familiar to how they send you suggestions of the next movie you should watch. Basically, this is done using your past search and watch data. This data is used to give them insights on what interests the subscriber most. See the screenshot below showing how Netflix gathers big data. The unprecedented times and highly risky business environment calls for better risk management processes. Basically, a risk management plan is a critical investment for any business regardless of the sector. Being able to fore see a potential risk and mitigating it before it occurs is critical if the business is to remain profitable. Business consultants will advise that an enterprise risk management encompasses much more than ensuring your business has the right insurance. So far, big data analytics has contributed greatly to the development of risk management solutions. The tools available allow the businesses to quantify and model risks that they face every day. Considering the increasing availability and diversity of statistics, big data analytics has a huge potential for enhancing the quality of risk management models. Therefore, a business can be able to achieve smarter risk mitigation strategies and make strategic decisions. However, organizations need to be able to implement a structured evolutionary so as to accommodate the broad scope of big data. To achieve this, organizations collect the internal data first so as to gain clear insights that will benefit them. More important is the integrated process of analysis that a company uses. A proper big data analytics system helps ensure that areas of weaknesses or potential risks are identified. UOB bank from Singapore is an example of a brand that uses big data to drive risk management. Being a financial institution, there is huge potential for incurring losses if risk management is not well thought of. UOB bank recently tested a risk management system that is based on big data. The big data risk management system enables the bank to reduce the calculation time of the value at risk. Initially, it took about 18 hours, but with the risk management system that uses big data, it only takes a few minutes. Through this initiative, the bank will possibly be able to carry out real-time risk analysis in the near future (Andreas, 2014). Another huge advantage of big data is the ability to help companies innovate and redevelop their products. Basically, the big data has become an avenue for creating additional revenue streams through enabling innovations and product improvement. Organizations begin by correcting as much data as would be technically possible before designing new product lines and re-designing the existing products. Every design process has to begin from establishing what exactly fits the customers. There are various channels through which an organization can study customer needs. Then the business can identify the best approach to capitalize on that need based on the big data analytics. “Gone are the days when you could go with your gut” (Rampton, 2017). To improve the quality and streamline your manufacturing performance you need to collect huge data. The gut intuition is basically no longer reliable if an organization wants to compete in the 21st Century. This means that these organizations must come up with means for tracking their products, competitors and customer feedback. Once the data is availed, an analysis is then conducted to ensure logical reasoning is applied before an action plan is devised. Luckily, product manufacturers of every size have a unique advantage when it comes to gathering and harnessing big data. This, therefore, means that these organizations can easily improve their product line by producing innovative products. You have probably heard of Amazon Fresh and Whole Foods. This is a perfect example of how big data can help improve innovation and product development. Amazon leverages big data analytics to move into a large market. The data-driven logistics gives Amazon the required expertise to enable creation and achievement of greater value. Focusing on big data analytics, Amazon whole foods is able to understand how customers buy groceries and how suppliers interact with the grocer. This data gives insights whenever there is need to implement further changes. Big data offers supplier networks greater accuracy, clarity and Insights. Through the application of big data analytics, suppliers achieve contextual intelligence across the supply chains. Basically, through big data analytics suppliers are able to escape the constraints faced earlier. This was through the use of the traditional enterprise management systems and the supply chain management systems. These legacy applications didn’t leverage big data analytics, and therefore suppliers incurred huge losses and were prone to making errors. However, through modern approaches built on big data, the suppliers can be able to leverage on higher levels of contextual intelligence which is necessary for supply chain success. Modern supply chain systems based on big data enable more complex supplier networks. These are built on knowledge sharing and high-level collaboration to achieve contextual intelligence. It is also essential to note that supply chain executives consider the big data analytics as a disruptive technology. This is based on the thinking that it will set a foundation for change management in the organizations. PepsiCo is a consumer packaged goods company that relies on huge volumes of data for an efficient supply chain management. The company is committed to ensuring they replenish the retailers’ shelves with appropriate volumes and types of products. The company’s clients provide reports that include their warehouse inventory and the POS inventory to the company, and this data is used to reconcile and forecast the production and shipment needs. This way, the company ensures retailers have the right products, in the right volumes and at the right time. Listen to this webinar where the company’s Customer Supply Chain Analyst talks about the importance of big data analytics in PepsiCo Supply chain. Big data analytics is an important investment for a growing business. Through implementing big data analytics businesses can achieve competitive advantage, reduced the cost of operation and drive customer retention. There are various sources of customer data that businesses can leverage. As technological advancements continue, data is becoming readily available to all organizations. Technically, it is fair enough to say that organizations already have data at their disposal. It is up to the individual organizations to ensure they implement appropriate data analysis systems that can handle the huge data. Does your business have big data analysis mechanism in place? Learn from the above examples of successful brands and implement one today.